OSEA's Combined Energy Options Ontario working group is proud to host a roundtable discussion with Mr. Rainer Hinrichs-Rahlwes on integrated, long-term, sustainable energy planning in Ontario, based on the European experience. You can still join via Conference Call. Please RSVP to get the details. Rainer Hinrichs-Rahlwes is Vice-President European Renewable Energies Federation, Board Member, Bundesverband Erneuerbare Energie . Rainer Hinrichs-Rahlwes is the President of EREC, the European Renewable Energy Council, the umbrella organization of European renewable energy industry, trade and research associations. He is also the President of EREC’s member Association EREF, the European Renewable Energies Federation, the voice of independent producers of energy from renewable sources. 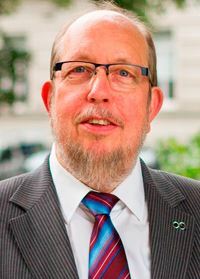 He is a Board Member of the German Renewable Energy Federation (BEE), BEE’s Spokesperson for European and international affairs, and Chairman of BEE’s related working group. He is a Member of the Steering Committee of the global Renewable Energy Policy Network for the 21st Century (REN21), which was founded as an outcome of the first “International Renewable Energy Conference” (renewables2004). He is a Member of the Renewables Industry Advisory Board (RIAB) of the International Energy Agency (IEA) and a Member of the WREN-Council, the advisory structure of the World Renewable Energy Network. From November 1998 to December 2005, he was a Director General in the German Federal Ministry for the Environment, Nature Conservation and Nuclear Safety (BMU), in charge of – among others – renewable energies and climate protection. As a representative of BMU he was one of the two chairmen of the International Steering Committee preparing the renewables2004-conference in Bonn. After the conference, he served as BMU’s representative and a founding co-chair and later a member of the Bureau of the Global Policy Network, now known as REN21.